Indian Cooking Challenge is something that I always look forward to. Cooking special and traditional dishes from a particular state is very interesting. This month we have Badaam or Almond Halwa. This is a speciality of Rajasthan. Halwas are sweet and dense loaded with ghee or butter. We have a variety of Halwas, They could be flour based, fruit or lentil based or even nut based, just like this Almond Halwa. This halwa reminds me of my friend, who was a Rajasthani. Once while was making this halwa her mixy conked off. Being neighbors she asked if I could make a paste of the almonds. I agreed and made the paste of nearly a kilo of these almonds. After about an hour I received a bowl of the ready halwa and that is the first time I tasted this. I immediately fell in love with it. Memories of my friend and Badaam Halwa came back. Unfortunately I lost my friend many years ago, but whenever I make this halwa I immediately think of her. God Bless her soul. Wash and peel, wash again. Make a fine paste of these, using bare minimum water or milk. Heat ghee preferably in a non stick pan. Roast the paste till it turns to a nice pink color. The almond paste has the tendency to stick so make sure you keep scraping it from the pan, if using a non stick pan it will be a easy job. Make sure the flame is very slow through out roasting. Since i did not use a non stick pan, I switched off the gas twice to scrape off the sticky almond. Once the almonds are a nice pink and lend a aroma, add water gradually bringing it to the correct halwa consistency. Add sugar and cardamom powder . Mix well and simmer till the ghee floats up. I made the halwa with just 1/4 cups of almond , after eating all those Diwali treats, I knew a small portion would be fine and everyone would have it like a prasad. 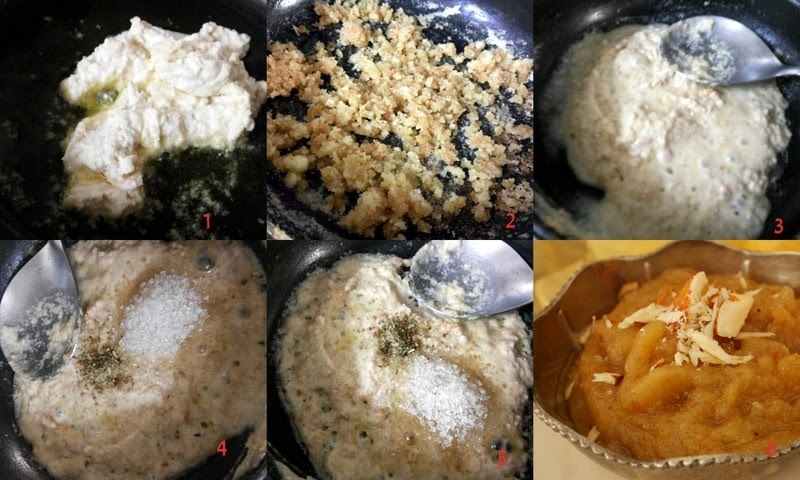 In fact everyone thought that it was prasad and ate a spoonful without any fuss. It was later I told them that it was Rajasthani Prasad made at Ribbons to Pastas.